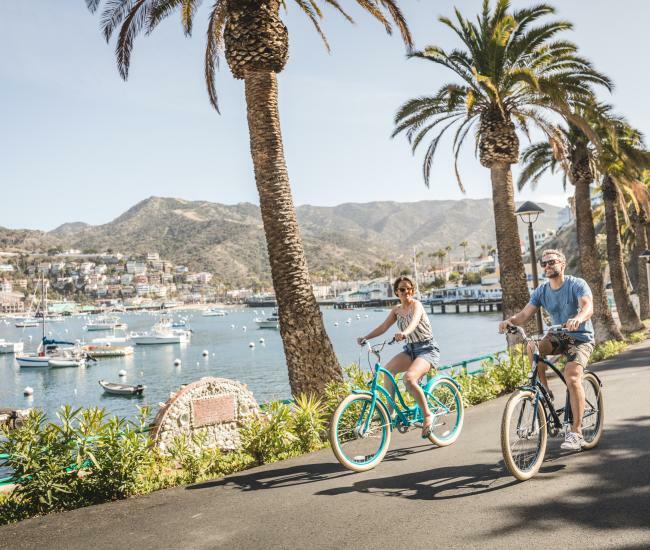 Catalina Island hosts a wide array of animals, ranging from majestic bison to diminutive foxes and from massive blue whales to agile dolphins. On land, sky and sea, these creatures thrill visitors, contribute to the island’s heritage and are part of the unique fabric that forges the environment of Santa Catalina Island. Catalina’s terrestrial wildlife includes several introduced species as well as fascinating native creatures found nowhere else on earth. 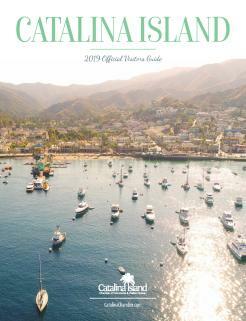 One of the most iconic Catalina animals was brought to the island for a film shoot in the 1920s. North American Bison – popularly known as buffalo – were shipped to the island in anticipation of them making a grand appearance on the silver screen. Although the scenes with the bison landed on the cutting room floor, the bison on the island thrived, becoming so much a part of the landscape – and the Catalina culture – that their future here is assured. Bison on Catalina are found on logos, restaurant names, souvenirs and countless postcards. They also make two appearances on menus – as buffalo milks and bison burgers. The Buffalo Milk cocktail first made an appearance at Two Harbors in the 1970s, but their deceptive deliciousness assured that the drink quickly became an island favorite that every bartender on Catalina knows how to make. The frothy concoction includes bananas, Kahlua, vodka, crème de cacao and crème de bananas – no milking of buffalo required. Bison meat -- high in protein, low in fat and with a much lighter hoof print on the environment than beef -- has become a popular alterative around the country and Catalina is no exception. Frequently described as slightly sweeter than beef, bison meat has been embraced by burger fans and environmentalists alike. The Catalina Bison Burger Trail showcases those restaurants that serve their own variation of bison burgers, providing a new opportunity to sample this beef alternative while experiencing a wide range of restaurants. Seeing actual bison on Catalina Island is as easy as getting out of town. North American bison, which are honored on the first Saturday of November on National Bison Day, can be seen on an interior tour, while hiking the TransCatalina Trail and while camping at several Catalina Island campgrounds. Catalina Island bison share their home with two other grazers that have been introduced by humans long before we realized that bringing non-native species to a new environment was a bad idea. Mule deer were introduced in the 1920s in the hopes of creating a draw for hunters. Since then, the prolific animals have thrived on the island. Visitors and locals alike frequently see them in Avalon, where they snack on landscaping and are nearly tame. Indian blackbuck antelope, another exotic species brought over as an experiment in hunting, survives in a very small – and rarely seen -- population near the Airport the Sky. Catalina’s native mammals, while not as large, are equally as fascinating. Catalina Island foxes, slightly smaller than a housecat, are the largest native mammal. Having recently been removed from the Endangered Species List, these endearing canids are now often seen throughout the island, particularly at dawn and dusk, when they are most active. Native foxes are accompanied by squirrels, mice and shrews as native Catalina Island mammals. Nearly 200 species of birds have been spotted on the island, making Catalina a popular destination for birders hoping to add to their life lists. Birds on Catalina are particularly diverse, due to the wide range of environments – shorebirds, raptors and grassland species all make their year-round homes here and a large number of bird species make Catalina a stop on their annual migrations. Two of the most intriguing birds on Catalina include both one of the island’s largest species and its smallest. Thanks to an intensive re-introduction campaign, bald eagles once again soar free over the island. The USA’s national bird is frequently spotted by visitors along the island’s coastline and popular webcams provide an intimate look at the majestic birds as they rear their chicks. On other end of the spectrum are hummingbirds – Catalina is home to two species, Allen’s and Anna’s – which are found throughout the island, particularly in Avalon, where they find decorative flowers and bird feeders irresistible. Spotting one of Catalina’s other native bird species requires a trip to the interior. A subspecies of quail native to the Southern California mainland, the Catalina Island quail is a ground-dwelling species about the size of a pigeon. With their distinctive grey coloring and black topknot, Catalina Island quail are an exciting sight off the beaten path in the Catalina Island interior. In Avalon, Catalina’s visitors frequently get an up close and personal look at a variety of birds of prey, thanks to an innovative program to control the pigeon population. On The Wing Falconry uses these impressive avian predators to make Avalon less hospitable to pigeons. The aerial acrobatics of hawks and falcons are on display several times a week, swooping low along the pier or soaring over the heads of surprised visitors on Crescent Avenue. Catalina wildlife is frequently spotted even before arriving on the island. Dolphins and whales are regularly seen from the ferry to Catalina, thrilling visitors and locals alike. The most common dolphin seen is, well, the common dolphin. These gregarious and athletic mammals congregate in massive pods that can include up to thousands of animals. Leaping from the sea, they frolic from both the bow and the stern of the Catalina ferry, inspiring awe and “ahhs.” Much larger than their “common” cousins, Pacific bottlenose dolphins are also frequently spotted on the ferry to Catalina as well as on dolphin tours that leave from Avalon. 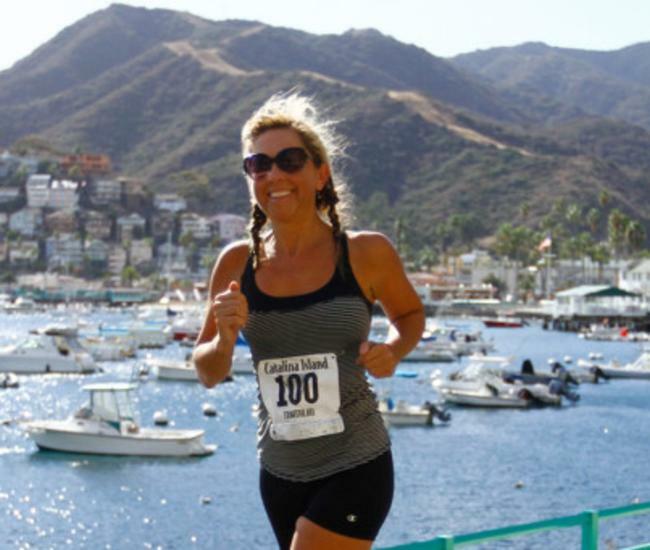 Risso’s dolphins, pilot whales and orcas can also be spotted during a Catalina crossing. 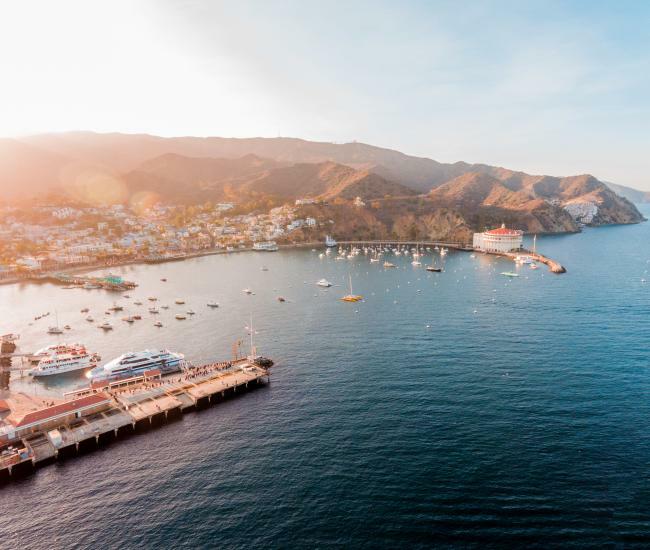 Catalina Island whale watching can be equally as rewarding. From November to March, California gray whales pass the island on their annual migration – the longest of any mammal. Wintering in the warm lagoons off Baja and summering in the nutrient-rich waters off Alaska, the great mammals are a frequent sight from the Catalina ferry when the migration is underway. In the summer months, the largest creature on the planet is regularly seen in the waters around the island. Growing up to 100 feet, blue whales dwarf even the largest dinosaurs and in July and August these behemoths cruise around the island, inspiring wonder wherever they are seen. Mammals aren’t the only ocean residents that intrigue visitors to the island. Each spring, flying fish arrive, shooting from the waves in long-distance leaps to avoid predators. The unique finned flyers have become part of the culture of Catalina, appearing on postcards and taking center stage on a number of tours.